Warhammer Online's new trial system could end up enticing a bunch of new players to give the game a try. Mythic Entertainment has just implemented a new endless free trial system for Warhammer Online. This does not mean that the game can be played all the way up to level 40 for free, but it is a great way to try to get players hooked. Warhammer Online's endless free trial period is played through a "streaming client," requiring only about a 1GB download, and allows players to reach level 10 at their leisure. Any of the game's 24 careers can be tested out up to this level cap. The trial will limit players to tier one zones, including tier one dungeons and tier one PvP scenarios. I wouldn't be surprised if some players end up playing tier one PvP for free for a very long time, but I do think this endless free trial is still a very smart idea. It takes a cue from the free-to-play MMOG movement, and is also a way to drum up new interest in a game that is actually quite good, but somewhat overshadowed by the similar World of Warcraft. 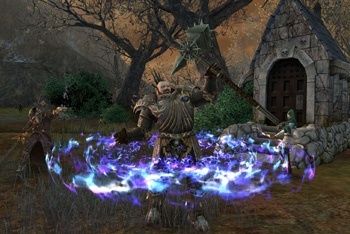 What Warhammer Online does much better than WoW, taking a cue from Mythic's predecessor Dark Age of Camelot, is PvP. At any point during play, a PvP scenario can be queued up. When it's ready, the player is teleported instantly, and teleported back to the same spot afterward. Some scenarios are simpler, requiring a team to grab an item and defend it for the longest while points accrue, while others are more complicated and involve various types of terrain and hazards. PvP gets deeper later on with all out Keep Sieges and capturing enemy capital cities.